Precious metals futures logged declines on Monday. Gold slipped a modest 0.1% but ended at a fresh low for the year. Gold for August delivery fell $1.80 to settle at $1,268.90 an ounce on the Comex division of the New York Mercantile Exchange. The settlement is the lowest since Dec. 19. The "near-term path of least resistance is still lower for gold, but a spike in volatility due to trade concerns could easily see futures run back towards $1,300," MarketWatch quoted Tyler Richey, co-editor of the Sevens Report. 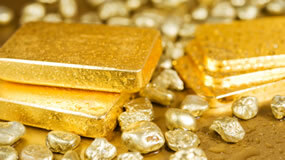 Gold futures ranged from a low of $1,265.50 to a high of $1,274.40. They declined 0.6% last week. Meanwhile, silver for July delivery lost 13.1 cents, or 0.8%, to close at $16.328 an ounce. Silver futures traded between $16.29 and $16.49. They dipped 0.1% last week. July platinum shed $4.50, or 0.5%, to $868.80 an ounce, ranging from $867.20 to $881.50. Palladium for September delivery fell $11, or 1.2%, to $935.40 an ounce, trading between $932.50 and $954.30. Last week, platinum fell 1.6% and palladium tumbled 3.6%. LBMA bullion prices are available on the LBMA website with a delay of midnight. In LBMA results for the week, losses reached 1.3% for gold, 4.6% for silver, 3.5% for platinum, and 3.9% for palladium. United States Mint bullion sales were unchanged Monday. Below is a sales breakdown of U.S. Mint bullion products with columns listing the number of coins sold during varying periods.